Since the time that the Gauchos started herding in the Argentinian Pampas, cooking meat over a fire has been a tradition in Argentina. Today, an Argentinian asado, or barbecue is a cultural ritual consisting of various kinds of sausages, sweetbread, various succulent cuts of beef, and sometimes chicken, and accompanied by chimichurri sauce. To keep the meats warm at the table, the Parillada is normally brought to the table in Braseros de Mesa, or Table Meat Warmers such as the ones we carry. The Stainless Steel model is an upgraded version of our Standard model and made of 20 gauge Stainless Steel, with a beautiful shinny finish worthy of any table setting. In Argentina, the most common way to use the Brasero de Mesa is to place just a few hot ambers from the fire inside of the Brasero and that keeps the meats warm. The idea is to place enough for warmth, but not too many to continue the cooking. Be careful when using hot coals! It is not recommended to use indoors as the burning ambers (especially charcoal) can be dangerous. When using the Brasero with hot ambers, make sure you are in a well ventilated area; do not use coals in enclosed areas. If outdoors, avoid placing the Brasero where the wind can spread the ashes to flammable materials. Do not put a hot Brasero directly on top of or around any highly-inflammable surfaces. For your safety, use protective mitts when handling the brasero. Today, the most common use is to place anywhere from 2 to 6 tea light candles strategically placed inside the Brasero, which are a safer option and provide sufficient heat. 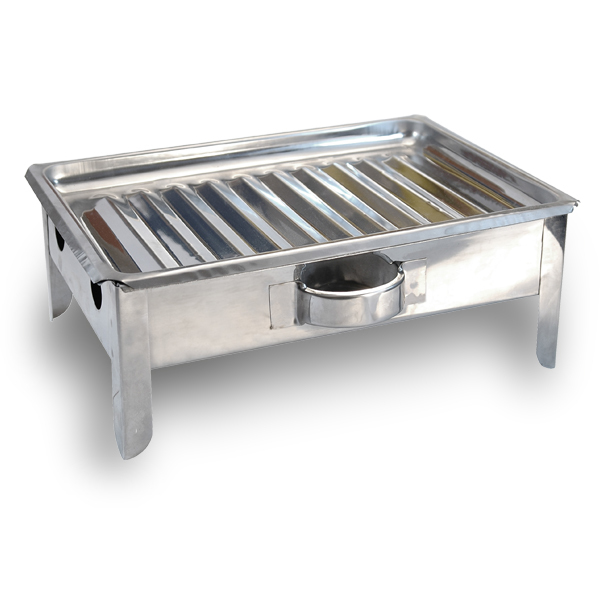 Whether you choose to use coal, tea lights or nothing at all, serving the grilled meats on the Brasero de Mesa will provide an authentic and unique presentation, perfect for any occasion. Thoroughly wash and dry the Brasero before first use. After using, allow the Brasero to cool before washing as sudden temperature change could cause the metal to warp. Continued exposure to high heat can cause a normal discoloration. For everyday cleaning, hand washing in hot, soapy water and drying it thoroughly with a soft cloth before storing is recommended to maintain the best appearance of the Brasero. Use nonabrasive pads and stainless steel cleaner to remove discoloration and stains. Do not use abrasive pads and steel brushes as they may scratch the surface. For the occasional dried-on or burnt food, let the Brasero soak in warm soapy water for about an hour.